The BHS Member Center hosts information about your chapter for members, associates, and general individuals interested in your chapter. This should not be changed or altered unless the information is blank or is incorrect. 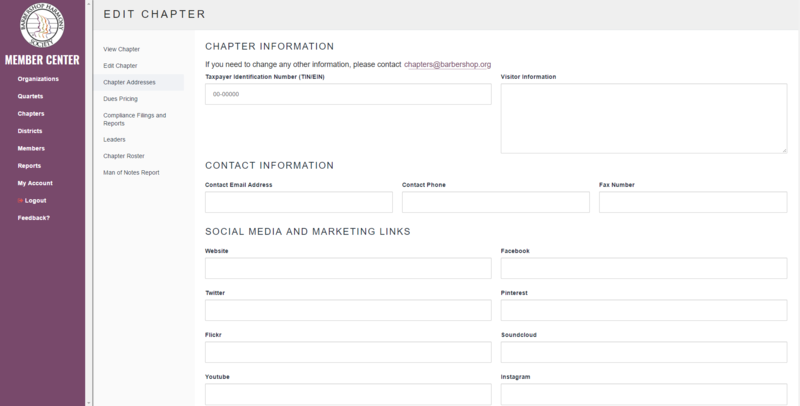 Your chapter(s) should display, click on the chapter in which you want to view/edit. 5. You can add, update or change the displayed information by entering the new information in the respective field. 6. As mentioned earlier, not all fields are applicable for your chapter. You can leave the information blank as none of these fields are required. 7. After submitting, the new information will display on the View Chapter option towards the left. This is the information that will display publicly for all members, associates, and those interested in learning more about your chapter. This also includes our chapter locator map. 8. Changes will automatically become effective upon submission so changes should be made with great care.